- A disastrous November, a Leafs mainstay of the past few seasons, was non-existent. The Leafs went 7-6-1, grabbing 15 points, keeping them near the top of the Northeast Division, only one point behind Boston. - This is even more impressive considering James Reimer hasn't played since October 22. He's close to returning, thankfully, but amazingly, Jonas Gustavsson has rallied back from Siberian exile and given himself a chance to back-up Reimer for the rest of the season. - I'll take full credit for the Gustavsson turnaround (and yes, maintaining a .898 SV% is considered a turnaround with Gus). Because anytime someone, somewhere on the internet makes disparaging remarks about an athlete, it clearly motivates them to play better. - Somewhat concerning is the fact that the Leafs went 1-4-1 at home during the month, although that one win was a shellacking of the Washington Capitals. So we'll just sweep this one under the rug with the rest of the problems I'm going to largely ignore during this post. - The inevitable Kessel slump didn't happen. In fact, Kessel still sits atop the league in both goals and points. He's really become a totally different player from last season and is looking like the franchise player Burke thought he was getting when he made that trade with Boston nobody ever talks about. - I don't want to talk about Tyler Seguin. That wound is still fresh. His happiness is my sadness. 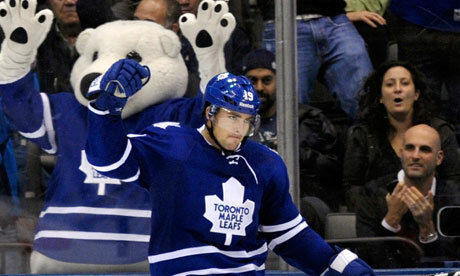 - Joffrey Lupul is second in league scoring. He's one point shy of surpassing last year's total points and is well on his way to shattering career highs in both goals and points. It's pretty amazing that he was basically a throw-in to the Beauchemin-Gardiner swap. I bet the Ducks want a mulligan on that one. - The powerplay is killing it. The Leafs sit second in the league to only Vancouver, which is one of the reasons the team is third overall in goals-per-game, trailing only Philadelphia and Boston. The defence and goaltending is still a work in progress, but the Leafs are still out-scoring their problems. - Tim Connolly wasn't hurt and he was good at a lot of things. He has 12 points in 13 games and is one reason for a resurgent Leafs penalty kill that is still only 27th in the league, but has been fairly stingy of late. Buffalo update: Tim Connolly 12 points, 13 games; Ville Leino 6 points, 24 games. - Remember how Tyler Bozak was -122143 last season and generally pretty bad? Well, he's turning it around, playing on the top-line (again! ), showing great chemistry with Kessel and Lupul. He's certainly not a viable #1 centre in the NHL, and everyone knows that, but he's at least holding the seat warm until a white knight shows up. - The Leafs continued their trend of playing Colton Orr twice a month. I think I can live with that little of Colton Orr in my life. - The Tomas Kaberle replica - John-Michael Liles - is outperforming the old model by a wide margin. Kaberle, in fact, has been so bad Carolina GM Jim Rutherford has made threats that he could be out soon if he doesn't improve. Kaberle's game went south when he decided to grow a moustache that was better fit for someone who ties damsels to railroad tracks. - Mike Komisarek was hurt and it actually wasn't a reason to celebrate. Somehow he's played decently. Miracles do come true. - Joe Colborne has four points in six games and looks NHL ready at this point. He's much faster than he was last season and looks like a realistic option as a top-6 centre at some point in the near future. This is important because Mikhail Grabovski is a UFA at season's end and could price his way out of Toronto. - Nazem Kadri was named the AHL's Player of the Month after scoring 17 points in 12 games, helping keep the Marlies in first place in their division. It's hard to tell when he'll get a chance with the Leafs, especially now that Colby Armstrong is getting close to returning. He may have to settle for a full season in the AHL, which would actually be a good thing. - I dreamt of Bobby Ryan for a few days. Sad that it probably isn't going to happen. Damn you, rational GMs of the world!